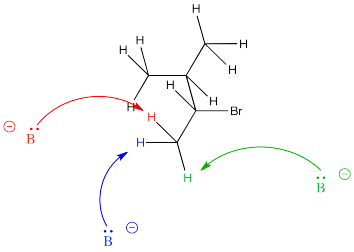 Sometimes, an elimination reaction could lead to formation of a double bond in more than one place. If the halide is on one carbon and there are protons that could be removed on either side, then taking one proton or the other might lead to two different products. This reaction could have different regiochemical outcomes, meaning it could happen at two different places in the molecule. What factors might influence which product forms? We might think about product stability, in case there are corresponding differences in barriers leading to those products. We already know about stereochemical effects in alkene stability, but what about other effects? It is well-established that alkene stability is influenced by degree of substitution of the double bond. The greater the number of carbons attached to the double bond, the more stable it is. That effect is related to hyperconjugation. Specifically, it's an interaction between bonding orbitals and antibonding orbitals on neighbouring carbons. The interaction allows the bonding electrons to drop a little lower in energy through delocalization. 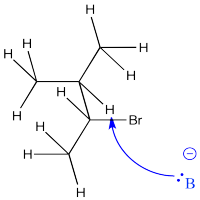 The interaction also pushes the antibonding orbitals a little higher in energy, but since they have no electrons, they don't contribute to the real energy of the molecule. Overall, the molecules goes down in energy. In most cases, the most-substituted alkene results from elimination reactions. However, alkene stability isn't the only factor that plays a role in elimination. Steric hindrance can play a role, too. 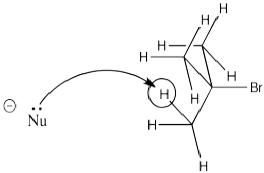 In a case in which there are two different hydrogens from which to select, the one leading to the more-substituted double bond is sometimes a little bit crowded. That leaves the base with fewer viable pathways to approach the proton. On the other hand, the removal of a proton leading to the less stable alkene is often less crowded, allowing the base to approach much more easily from a number of angles. 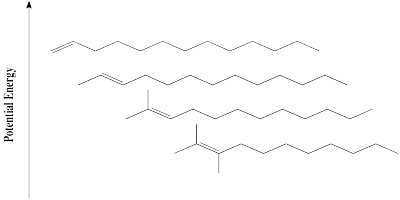 In some cases, especially with very bulky bases, the least substituted alkene forms, even though it is less stable.